Driving a school bus can be a drag. Every day, you travel the same roads, see the same houses, and deal with the same (sometimes literally) snot-nosed kids. The drivers responsible for bringing home one Texas teen, however, were treated to something truly different. When buses pulled up to Savannah Burns’s ranch home in Atlanta, Texas, it wasn’t uncommon to spot an unlikely animal charging full-speed towards the doors. The driver and the kids inside likely felt some mix of fear, confusion, and disbelief. What was that little black ball dawdling towards the bus with such ferocity? And what did it want that compelled it to sprint so gung-ho towards a vehicle full of kids? The answer was both surprising and adorable! It all started back in February 2017 when the Burns family first brought the the rooster home. Right away, they noticed he was kind of… weird. He had feathers all the way down to his feet and he moved unlike any chicken they’d ever seen. Despite having a ranch filled to the brim with social chickens and additional roosters, Frog wasn’t really interested in hanging with his brothers and sisters. Instead, he was far more interested in making human companions! Since the day they realized how special he was, Frog’s family has been careful to document thousands of photographs, mostly posted to social media, which chronicle his unique interests. At first, Savannah and Frog’s bonding experiences started small. She would scoop him up while she did chores, he would watch her intently, and that was that. No one realized just how strong their bond would become. “She’d take him to the laundry room and he’d watch attentively,” Holley Burns said. “She’d go and wash dishes and she’d set him up on the counter and he’d watch her wash the dishes.” This all had to be abnormal rooster behavior, right? You’d be hard-pressed to find a rooster that behaved in a way similar to Frog. In fact, a lot of roosters can be kind of snippy and territorial. Frog was practically the polar opposite. “When people see a rooster running at them,” Holley said, “everybody’s first instinct is, ‘Oh my God, he’s going to attack me. '” Just imagine what the bus driver must have been thinking when Frog came rushing toward the bus! 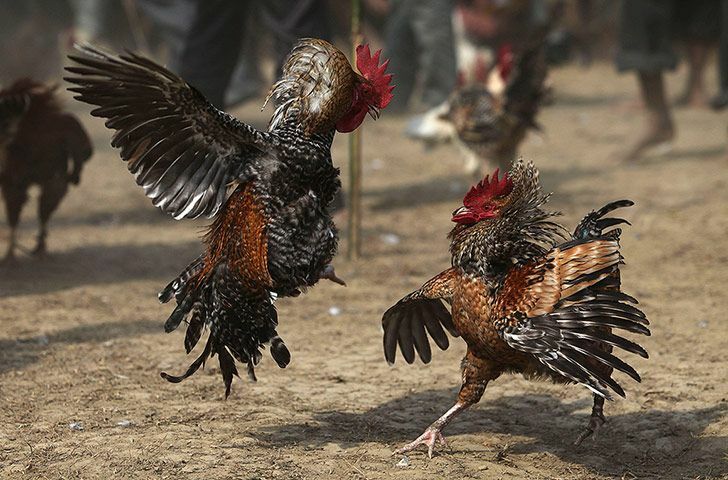 Nevertheless, while roosters can be rude of aggressive, it’s not because the birds are mean at heart. They’re just hardwired to protect females of the flock! So why did Frog act so different? Holley had a simple explanation. “I don’t think he thinks he’s a rooster,” Holley said. In fact, Savannah isn’t even the only non-rooster that Frog loves to hang out with. When the family dog, Casper, was afraid of a storm, Frog crawled up beside him for comfort. Since then, the two have been seen playing together all the time. “[Savannah] pulls him in a wagon,” Holley said. “Wherever she goes, he’s right behind her. He gets up on the bunk beds with her. He’ll sit and watch TV with her.” Talk about an entertaining life for a rooster!